Reputation Is Everything: Are You Ready for the New Economy? You may know Josh Klein as the guy who built a vending machine for crows (and his incredibly popular TEDTalk about it), his National Geographic TV series, The Link, or his popular free science fiction novel, R'ood. This hacker and writer's latest project is the book Reputation Economics: Why Who You Know Is Worth More Than What You Have. I chatted with Josh about how the internet is driving the shift toward this new economy, how it draws on traditional methods of trade, and how much his mother is worth. One of the more interesting trends in emerging technology that I've been following is the rise of new kinds of exchange platforms, like AirBnB, Uber, SkillShare, Headliner and even new ways of using Craigslist and Ebay. What they all have in common is a reliance on our ability to get enough information about the person we are exchanging with to feel comfortable determining rates, terms, etc. I.e., reputation. This trend is curious because reputation-based exchanges are how most human commerce was done pre-financially, and it's still the primary way value gets moved in a huge chunk of the global economy. We mostly call that the Black Market, but it's the second largest economy in the world, and is going to be the biggest market in the world within the next 15-20 years. In the U.S. it's estimated that 1 out of every 7 dollars is exchanged on the black market, and that number is growing. The exciting (and frightening) thing about this is that for all its size and power, the black market is just about to really pop as the two thirds of the human race who aren't online yet start to onramp via smartphones, tablets, etc. It's my bet that as they begin to use the tools and technologies we're developing now they're going to co-opt the best of them for their own use. And by "best" I mean "most flexible, most robust, and least taxable." Think BitCoin (or its descendants) vs. Citibank, except globally integrated, accessible, and exchangeable--all based on the largest, fastest growing, and least regulated market in the world. One of the most powerful stories that highlight the power of the reputation economy and the flaws of our current system involved terrorist funding for 9/11: "Terrorists found it easier and more secure to use an FDIC-insured bank to move the funds needed to crash a plane into the World Trade Center than an unregulated trust network comprised of their ethnic relatives." How does a reputation economy regulate itself and keep us safer? The same way that you know which of your neighbors you'd loan your car to. The "unregulated trust network" mentioned here is Hawala, a system that came out of the Middle East in the 8th century and which is still alive and well today. The way it works is that a hawaladar (hawala agent) takes something of value from you and trades something else of equivalent value to another hawaldar, who trades it for something with another hawaladar until it reaches the person you wanted to send value to in the first place. That "value" in each instance could be cash, stocks, access to resources, goats, or anything else, but the defining element is that all along the way each hawaladar interacts with the others based on trust. That's why the 9/11 terrorists didn't use Hawala; if any hawaladar had been discovered to have been working with terrorists, he or she would never have been able to act as a hawaladar again - he would have lost the trust of everyone who might ever want to trade with them. That reputation was the repository of their value as hawaladar, and their entire businesses relied on it. In a way, it's exactly like your eBay seller rating, except deeply integrated into your community, peer group, and business relationships. That deepening integration is exactly what I see as happening with online reputation today, for all of us, and it opens up some exciting new possibilities for exchange and mutual cooperation. It also makes us more vulnerable: Now more than ever, our reputation defines what we're worth. I love the links you made between distribution and reputation: by giving something away for free--increasing distribution--a creator generates more value in terms of reputation, direct trades, or opportunities. Can you talk more about this "abundance economy" and how the internet is really fueling the transition and empowering the creators? The internet is really good at passing digital goods around and reproducing them infinitely, with no loss of quality. As we're increasingly able to digitally represent "things" -from relationships to chairs-that capability is taking on new potential. Specifically, it means we can give things away without any financial remuneration because we know that other aspects of value are being created. For example, if I make a piece of software, or some music, or a CAD design for a chair, and I give it away, I don't have any less software, music, or chair than when I started. Instead, through sharing more people are able to access, evaluate, and redistribute my design, allowing me to build reputation and relationships that can create access and opportunity for me. In many ways it's the exact opposite of the traditional, scarcity economy: in this "abundance economy" distribution creates more value, rather than less. It's not as direct, but it's simultaneously more human, and more intuitive, to facilitate trade via relationships. One side effect is that when we exchange different things based on relative valuation we can see better returns for both parties. For example, if I have a surplus of corn, and really want some peppers, and you have a surplus of peppers but really want some corn, we can both trade at lower than market rate and yet achieve a better than market return. That "double coincidence of wants" is traditionally rare, in part because the act of exchange diminishes the available value. On the internet, however, it's not only easier to find someone who happens to want exactly what you have in exchange for exactly what you want to receive, it's possible to do it in a way that makes each party richer, rather than at least one party less so. It's important to note that it's easy to overblow this and make it sound like the solution to all evils, (as well as being contrary to some fundamental laws of physics), but in certain cases it really does work out nicely. Sharing on Twitter, for example, or giving away free chapters from a book, or new models of investment like Kickstarter or Crowdfunder are all instances in which an abundance economy approach really pays off, and they're models that are increasingly available to everybody. Invest in relationships. Capitalize on what you can provide to others that has high value to them and low cost to you. Be helpful, and passionate, and don't be a jerk. Spend time investing in communities of interest and build strong contacts within your network; these are both high-yield activities that are likely to pay off in the near term. I'm working now on a platform to do exactly this (www.ntwrkr.co), and I expect this sort of networking tool to become more commonplace as we start to recognize how much value comes out of our relationships vs companies. 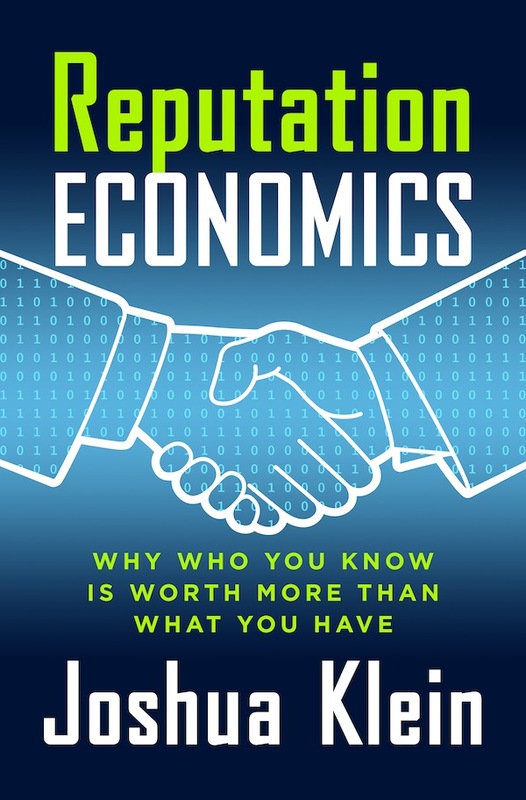 Reputation Economics is available from Amazon, Barnes and Noble and IndieBound. You can read the first chapter for free at www.reputation-economics.com. Learn more about Josh at www.josh.is.